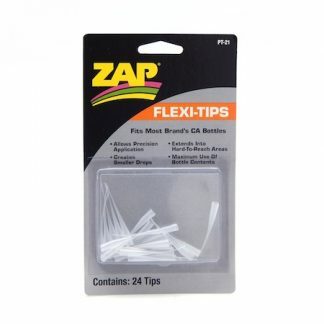 Home / Model Supplies / Adhesives / CA Glue / ZAP Thin CA Glue, 1 oz. ZAP Thin CA Glue, 1 oz. 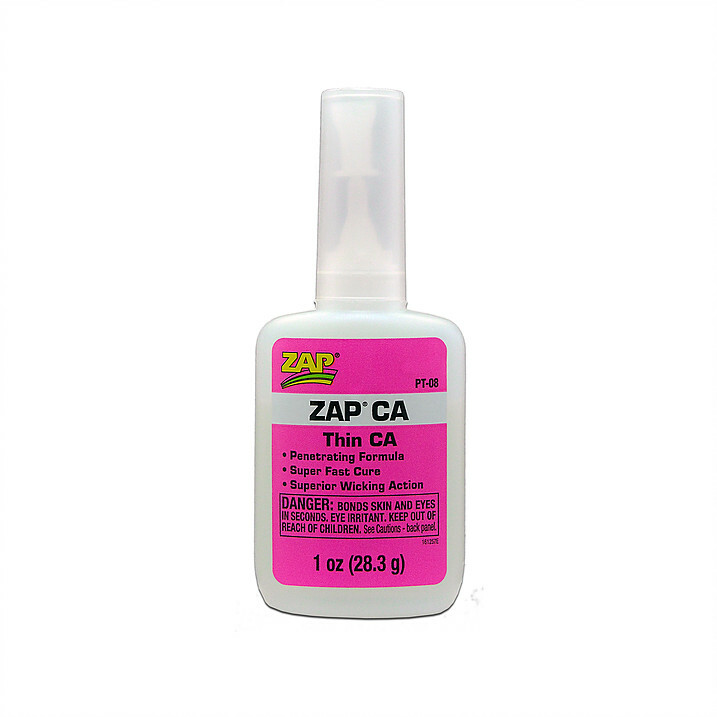 ZAP CA glue is a thin formula, favored by model builders assembling our precision laser-engineered kits. If you are; new to model building, working with a child, have shaky hands, or are building from hand-cut parts – may we suggest that you instead look to a medium viscosity formula. 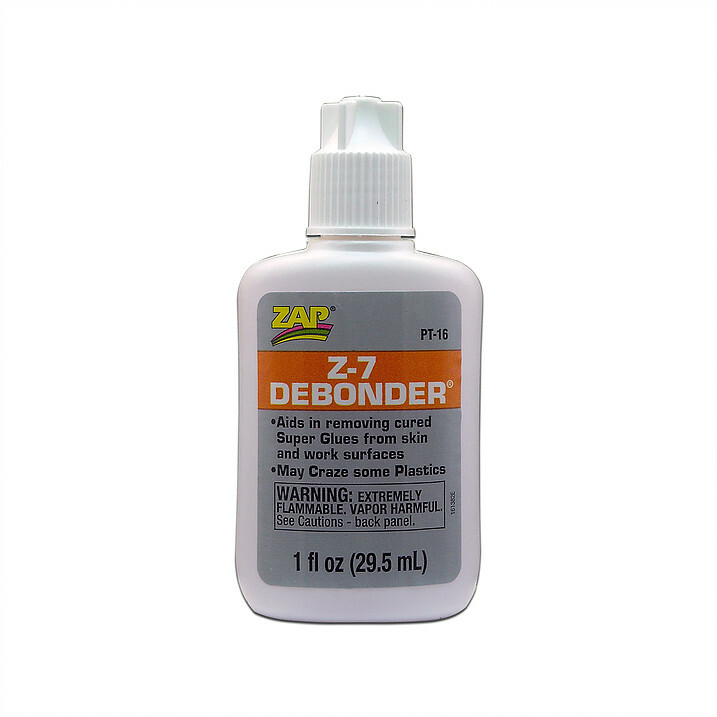 Caution: Thin CA glue runs absolutely everywhere and can be very tough to apply properly – always use a glue tip and ensure that you have debonder at the ready. Add 24 precision glue tips! Improve the quality of your model building. A glue tip allows precise application and metering of CA – ensuring that glue is applied only where you want it. 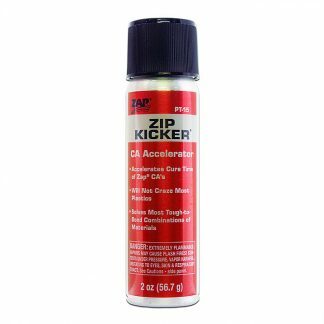 When working with thin CA glue you shouldn't really need a kicker – however you may find it essential for setting repairs. Working with thin CA glue? Expect to get stuck. Purchase this CA glue debonder while you still can! Tick the "add" box below while your fingers not stuck together. ZAP CA Is the thinnest CA in the ZAP product line. The penetrating or wicking ability of this glue makes it a favorite of modelers around the world. Balsa wood is bonded almost instantaneously, with the glue sometimes traveling several inches into the parts (watch getting your fingers stuck!). Why use medium CA glue? *Typically a kicker is not required for thin CA glue but can be used for tough to set repairs.